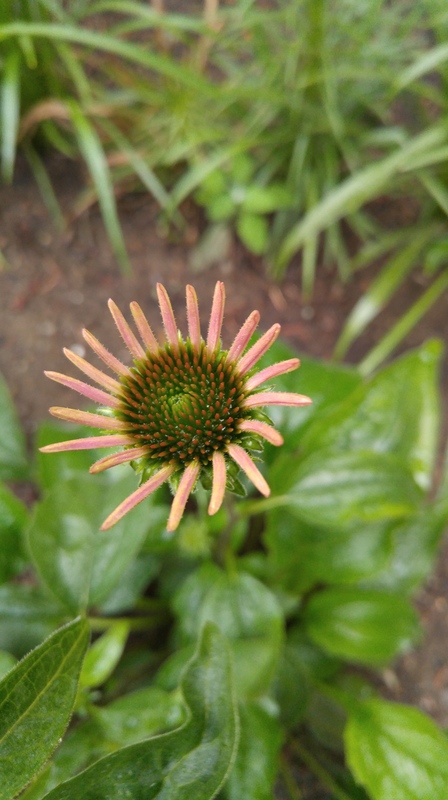 the coneflowers are starting to bloom!! I woke up this morning to the sound of rain. It is somewhat calming. After making my coffee, I went out to the Jeep to close its windows. Thankfully, with the tree cover we have in the driveway, not much rain got into the Jeep. I then walked over and moved the plants that I have under the 5th wheel awning for sun protection out into the rain. I have to admit that I like having the ability to move these plants around, as needed/desired. I’ll have to move them back before I leave today because it is supposed to clear up and be around 85 degrees. My daughter is going in for surgery this Friday. They found a growth in her uterus. Her doctor says it could be just a random skin growth (???) and doesn’t seemed too concerned about it. We will know more afterward, of course. My daughter seems to be ok with it all, not worried, so I guess that is something right there. I’m heading up to her place on Thursday evening so I can take her to her appointment on Friday at 9am, and be there after her surgery. There is a part of me that wants to completely freak out about this, but I seem to be able to maintain a level of open-mindedness about it. Why freak out completely if I don’t need to, right? The doctor says the surgery shouldn’t inhibit her ability to have children one day, provided there is none to minimal scarring of the uterus wall. My fingers are crossed about that. I am not sure my daughter really wants to have children but I think she is a bit young to have the decision made for her. I was four years older than she is now when I had my hysterectomy, but I had already had 3 children so it didn’t seem as much as a loss to me. I had no intentions of having more children so it was a simple decision to make. Enzo, Achilles, and Luna are barely eating since Friday. Saturday, when we made their dinner, Enzo walked over to the fence, walked the length of it, looking about. I think he was figuring that the sound of dinner being made would bring Truman home. They went through a similar thing after Panda and Ninja were gone. I know it sounds a bit anthropomorphic, but I think the dogs are sad over the absence of a pack member. Maybe they are just feeding off of my sad energy. This entry was posted in Left foot, right foot, repeat and tagged ability, absence, Achilles, anthropomorphic, children, coffee, coneflower, daughter, dinner, dog, energy, Enzo, fenceline, financially independent, fingers crossed, Friday, growth, hysterectomy, Jeep, Luna, miss, morning, Ninja, open-mindedness, out of sorts, pack member, Panda, rain, sad, scarring, sun protection, surgery, Thursday, uterus, uterus wall, windows, work. Bookmark the permalink. I’m so sorry. It’s an awful time. I Hope everything goes well for your daughter.